Use our award-winning Room Planner to create floor plans and arrange furniture to see how products fit. Click the “Start Planning” button to begin. 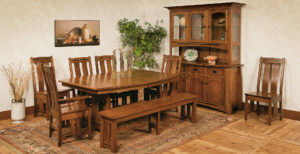 Presenting a cool, fun way to discover how Amish-built, solid hardwood furniture from Weaver will fit into your present dwelling. Or the rooms or entire home you’re dreaming about. It’s the award-winning Weaver Room Planner: No More Furniture-Buying Guesswork. You can design a room from scratch, or you can adapt an existing room. Simply use the drag-and-drop furniture and accessories icons. Or, have your designer create the room(s) of your dreams based on your input. Then, provide one of our skilled custom furniture associates with the plans. And we’ll work with you to full your dreams. Thanks to its 2-dimensional, full color, virtual reality renderings, the room planner is an excellent way to create future room designs. Or integrate historical projects/designs. Existing floor plans for your bedroom, dining room, home office, living room and youth bedroom are ready for your designer touch. The room planner takes the guesswork out of integrating different pieces of furniture into your home. Furniture items like bedroom benches, mule chests and blanket chests. Or jewelry armoires, mantel clocks and wine cabinets. It’s free. So start planning now. Drag-and-drop icons of plants, people, pets, automobiles and more create realistic-looking floor plans. You can create multiple layouts to see which ones work best. Click on the “Start Planning” button. And let your awesome room designs begin!